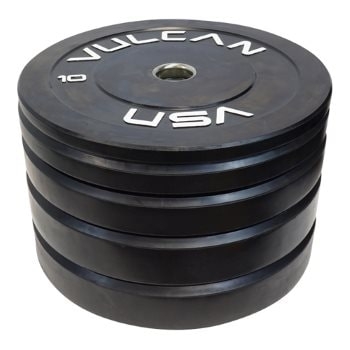 Vulcan Bumper Plates are built to endure the rigors of Olympic Weightlifting and CrossFit® workouts. Unlike lower priced brands, our Bumper Plates are made of a harder and denser rubber compound. As a result, our Bumper Plates have a much thinner profile and more plates can be fit on the bar . Others claim to have equivalent rubber hardness, but their 10lb and 15lb bumper plates "waffle" easily when dropped. The typical Bumper Plate has a thin pressed steel insert which will come out over time with repeated droppings. Our inserts are forged solid steel and anchored into the plate. We were the first to introduce this technology in 2011 and to this day we have replaced a handful of bumper plates out of multiple tons of plates sold. One of the things you will immediately notice when lifting our bumper plates is how snugly they fit together on the bar as well as the dead blow/low bounce effect they exhibit when dropped. It's a very noticeable sound compared to the clanking rattling noise and basketball-like rebounding you will experience with lesser brands. Made to IWF (International Weightlifting Federation) Standard diameter 450mm (17.7165 inch). Solid Rubber Bumper Plates made from virgin rubber not recycled rubber. Vulcan Bumper Plates have been tested to 30,000 drops from a height of 9 feet without any deformation of the insert or damage to the rubber surface. Shore Durometer A 88.7 - 89.1 What is Shore Durometer? See Here. Note: All bumper plate sets, bumper plate & Olympic bar packages and other heavy items may ship LTL freight. 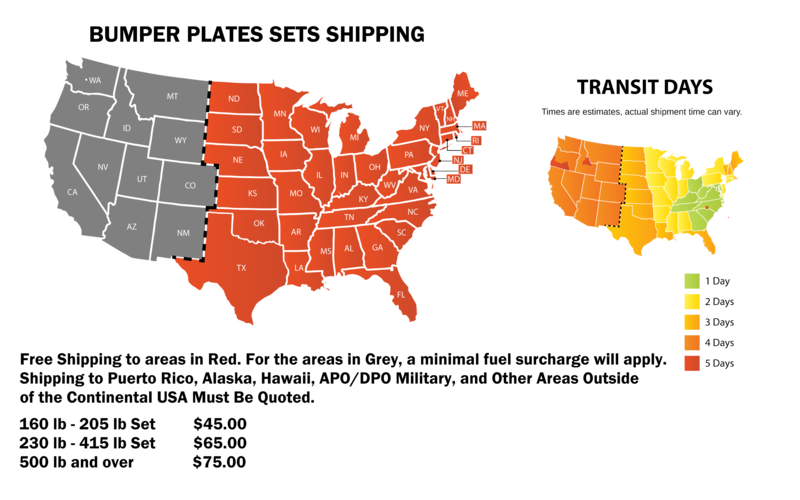 If you live in an area that is not accessible to a full sized freight truck contact us to make other shipping arrangements to avoid delays. You will be responsible for unloading the items from the truck, not the driver. If you require inside delivery or a truck with a lift gate to deliver, you must contact us for an additional rate quote for these extra services.